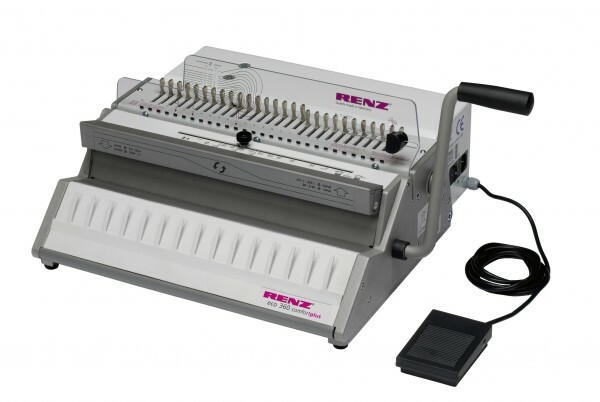 The new Eco-S 360 Comfortplus electric wire binder replaces the Eco-S 360 Comfort which has long been our most popular German built 2:1 electric wire binding machine for documents of all sizes up to 360mm spine length and 32mm thickness. The Eco-S 360 comfortplus wire binding machine is the ideal solution for anyone with the need to produce thicker books at times. The powerful new uprated motor with electric foot pedal punching takes the effort away-no more sore arm muscles. Suitable for all book lengths up to 360mm. Binds documents up to 32mm thick.